Motorola's Droid Bionic is now available from Verizon, making it the first device rocking a dual-core 1GHz processor to hit the carrier's 4G LTE network. The reviews have largely been positive, despite some reservations about the device's initial price ($300), along with a number of expensive accessories that could put an even heavier burden on your wallet. As Verizon originally promised the device would land in the second quarter of 2011, consumers have waited long enough for this phone--so let's dive right in and get to the details. The Droid Bionic runs Android 2.3 (Gingerbread) and features a 4.3-inch qHD display with 960-by-640 resolution and scratch-resistant Gorilla Glass, an 8-megapixel rear-facing camera that can capture 1080p video, and a front-facing camera for video chat. The Bionic packs 16GB of onboard storage, comes with a 16GB microSD card, and will support microSD cards up to 32GB. For connectivity, you've got Verizon's 4G LTE network that promises download speeds of 5 to 12 megabits per second and 2 to 5 mbps up, 802.11 b/g/n Wi-Fi and Bluetooth 2.1+EDR. The Bionic's browser includes HTML 5 support, and the device comes loaded with Adobe Flash. The handset also features an HDMI port for displaying its images on a bigger screen. The Bionic also comes with ZumoCast, a cloud storage app that lets you access remote files from your PC. PCWorld has a rundown of which Droid Bionic accessories are worth the price, but here are the highlights: You can get a vehicle navigation dock for $40, and a $40 desktop dock that charges the device and turns it into an alarm clock. For $100 you can get an HD Station with three USB ports and an HDMI port to display the phone's apps in full screen on a monitor or TV via HDMI. Finally, big spenders can shell out $300 to get a laptop shell called the Lapdock. The 11.6-inch laptop dock and the HD station both give you access to a modified Ubuntu Linux interface, and a full version of Firefox 4.0 (hopefully, the DigiNotar certificates are already revoked). 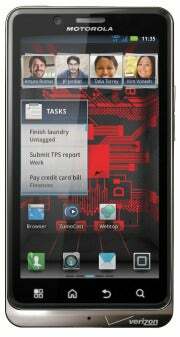 The Droid Bionic is available from Verizon retail outlets and Verizon's website. As noted, the device costs $300 with a new two-year contract. The Bionic is also showing up on Best Buy's website, but is not yet available there. For a limited time, you can get a $100 mail-in rebate if you buy the Lapdock and the Bionic and subscribe to the 5GB data plan ($50) or higher. So far, reviews of the device have been largely positive. Critics love the Bionic's speed, quality camera, and overall design, but the display quality doesn't appear to be overwhelming reviewers. PCWorld’s Ginny Mies found the display disappointing; both CNET and TechCrunch felt the display didn't beat the Super AMOLED displays found on recent Samsung devices; and in reading the This Is My Next review, the writer seemed to be suppressing a yawn, saying the Bionic's display was "not dissimilar from other Motorola devices." PCWorld is still doing lab tests on the Droid Bionic, so check back with that review later for results on battery life.